Farmers' Markets are a favorite of The 99 Cent Chef. There is nothing more engaging than tasting free fresh fruit slices and people-watching in L.A.'s community outdoor markets. I've tasted $1 shots of wheat grass juice at Santa Monica's, free hummus samples at Hollywood's, inexpensive soul food at Leimert Park's, and free slices of peaches and plums at Culver City's. While fresh organic produce may be a dollar or more per pound, the intensely fresh flavors of locally grown produce are worth the extra price the penny-pinching chef sometimes pays. In his latest video, The 99 Cent Chef takes you from one end of Culver City's Farmers' Market to the other end, in one continuous real-time four-minute take -- Martin Scorsese eat your heart out! Walk with the Chef through stalls loaded with organic fruits and vegetables, past bags of fresh herbs for $1, and to a free fresh fruit tasting station. After watching the Chef's video you will want to visit your own local farmers' market. The Chef lives next-door to Culver City, and its market is every Tuesday from 2-7 p.m. It has tempting tamales for sale, locally-made cheese and hormone-free meat stalls, a fresh roasted peanut in-the-shell stand, live music, and all the fresh flowers, fruit and vegetables you can carry out. Be sure to bring your own shopping bag, too. Nothing looks more hypocritical than walking around loaded down with white plastic bags in a farmers' market -- come on, it's all about fresh, organic, local and no plastic! On my last visit I bought a bunch of golden beets for $1.25. 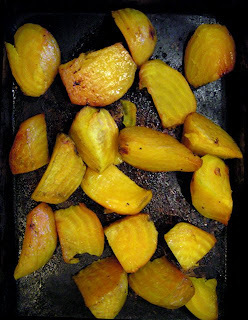 The most simply delicious recipe is to peel, slice, season, add a drizzle of olive oil and roast. 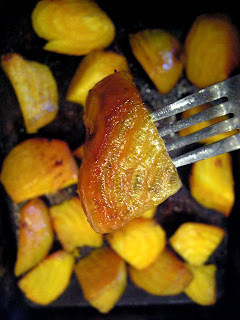 Fresh roasted beets are meaty, and caramelize sweet, with a slight radish-type heat -- much different than from the can. They add texture and color to your favorite salad, and are ideal just as a side dish. 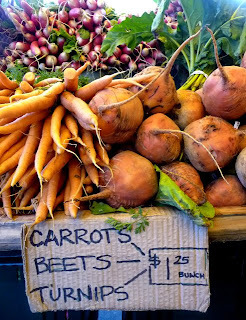 Enjoy The 99 Cent Chefs' video tour through Culver Citys' Farmers' Market, and try out his Roasted Beets Recipe. Play it here. The video runs 4 minutes, 12 seconds. 1 bunch of beets - three to four large ones, any color. Preheat oven to 350 degrees. Peel and slice (about 6 slices per) beets. Arrange in a shallow baking dish. Drizzle with olive oil and season with salt and pepper. Bake uncovered 45 minutes to an hour. Fork will pierce beet slice easily when done. Serve as a side dish or allow to cool and serve in a salad. Culver City Farmers' Market - map here. Click here to find your local Los Angeles Farmers Market - times and map directions. We must be neighbors; I live 'next door' to Culver City as well and love walking over to the farmer's market. It certainly isn't the biggest market in the area, but it is a good one! Ken would have loved this recipe; he liked beets. We've planted some in the garden, and I plan to cook some as soon as they get eating size! Thank you.